Barefoot In Blue Jeans: Photo A Day! Summer! 6/16/12! 2nd Photo! Photo A Day! Summer! 6/16/12! 2nd Photo! My cousins and aunt came over to pick up Brittney so that she can spend the night at their house. 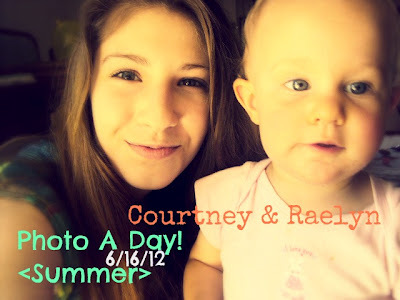 I was trying to figure out what to do for my photo today and I love taking pictures with little Raelyn. So, I decided to just do that. It was cute and you can also see the results from my new makeup! I am going to do a review on the makeup and new face wash in a few minutes. She is so cute! She is always moving, that's why her side, she is a little blurry... :( Oh well. It's still soo cute! I love this project so far!